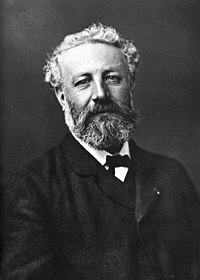 Jules Gabriel Verne (pípè ní Faransé: [ʒyl vɛʁn]; February 8, 1828 – March 24, 1905) was a French author from Brittany who pioneered the science-fiction genre. He is best known for novels such as Twenty Thousand Leagues Under the Sea (1870), A Journey to the Center of the Earth (1864), and Around the World in Eighty Days (1873). Verne wrote about space, air, and underwater travel before air travel and practical submarines were invented, and before practical means of space travel had been devised. Àtunṣe ojúewé yi gbẹ̀yìn wáyé ni ọjọ́ 10 Oṣù Kẹta 2013, ni ago 07:05.